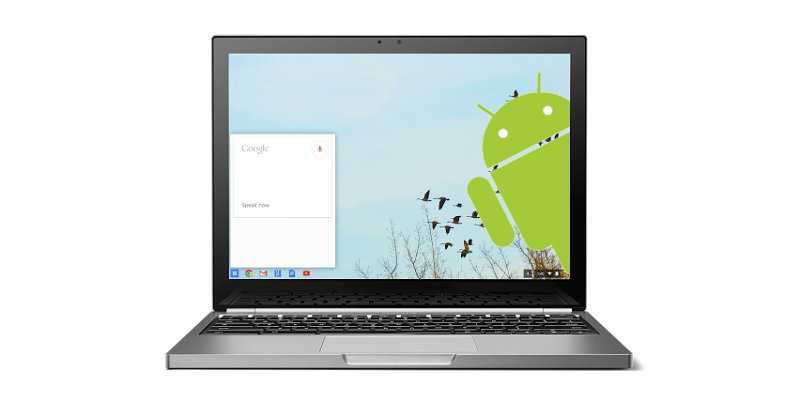 Chrome OS merged with Android. It’s every Pixel C owner’s dream. But for so long, the dream has not had much in the way of solid evidence for its existence. Sure, you could sideload some Android apps using a hacky method to install apks as Chrome extensions but even with some nifty automation tools it was still quite inconvenient to use. Thus users looking for a great tablet experience were left out in the cold thanks to Android’s admittedly subpar multi-tasking/multi-window interface. Android N is looking to fix that by finally implementing multi-window into stock Android, though judging by the Android N developer previews they still have some work cut out for them. On the other hand, the lack of a fully stocked app store on Chrome OS has left Google’s laptop users pining for more. While the situation has been improving as time went on, the overall situation for Chrome OS adoption is looking rather grim. Compare that to the market juggernaut that is Android and you can understand why many people want Google to go ahead and merge the two operating systems already. But then a report came out of The Wall Street Journal that stated that with the Google –> Alphabet transition, Google would phase out Chrome OS and merge it into Android. However, Google quickly squashed those hopes by issuing a statement that they had no plans to phase out Chrome OS. We ended that piece by asking you your thoughts on the independence of Chrome OS and Android, however, what if Chrome OS and Android were not set to merge, but rather become inter-compatible? Well, one user accidentally stumbled upon some evidence indicating that Chrome OS may soon implement the Google Play Store. The user claimed that this option showed up one second while he opened up the settings app on his Chromebook, but then it quickly disappeared. Of course, screenshots can be easily faked, so it’s imperative that we look for some stronger evidence pointing to this being the case. Other users in that thread began digging around in Chrome OS’s source code and found some rather interesting changes. In this block of code, we can see the there’s a string that enables a checkbox for turning on the ability to run Android apps on your Chromebook. The mention of ARC is most likely referring to Google’s App Runtime for Chrome which is the method that is previously how users were able to sideload apps on their Chromebook. Further evidence can be found in this github page that lists strings for UI localizations. Now, it looks like Google will be using this runtime to enable the installation of any app that you can find from the Google Play Store. 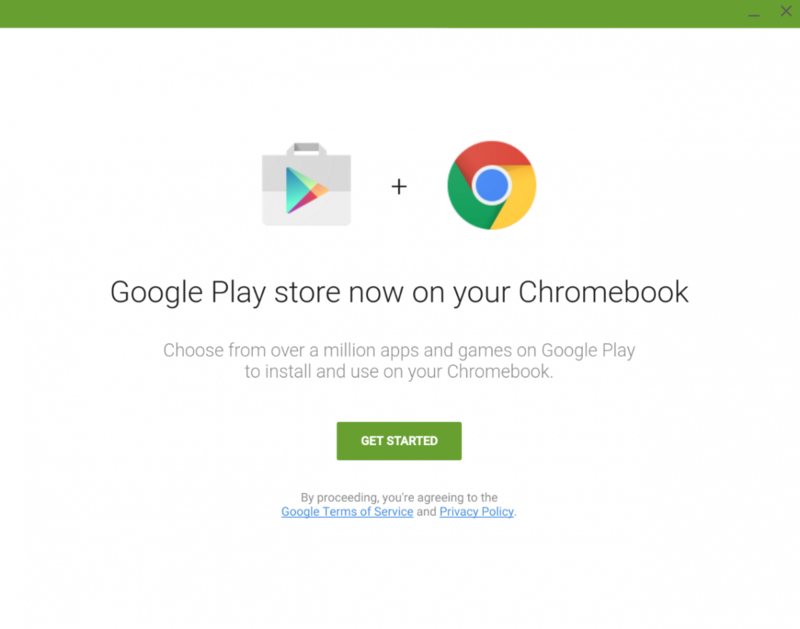 As you can see, after you check the box you are prompted with a dialog that sets up Google Play Store on your Chromebook. 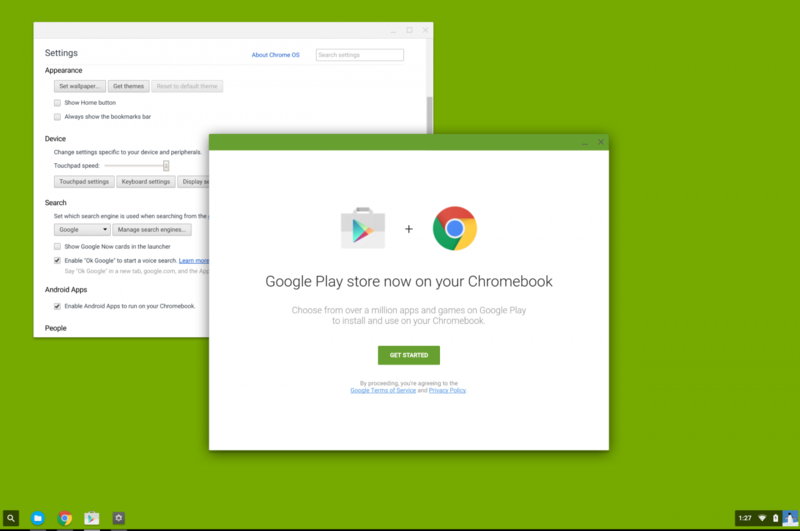 You are told that you can choose from “over a million apps and games” on Google Play to install on your Chromebook. We’re fairly certain this is just the boilerplate text and that there isn’t any actual restriction, but we can’t be sure until the feature is actually available. Google I/O 2016 is less than a month away. That’s typically when they announce any major feature changes. And I would say this is feature change certainly could be categorized as such. This is a game-changer for Chrome OS. Unlike BlackBerry’s failed Android app implementation, this is Google’s in-house version. They have Google engineers working on this and have access to the expertise of their own Android software developers. Google I/O 2016 can’t come fast enough. Will your Chromebook actually be supported, however? This feature might require an update, which would mean certain Chromebooks might miss out if they reach end-of-life before Google I/O this year. Hopefully, users of certain older Chromebook models won’t be left out (I can’t imagine that you would really need newer hardware to run an Android app) but that’s completely up to Google. What do you think of this rumor? 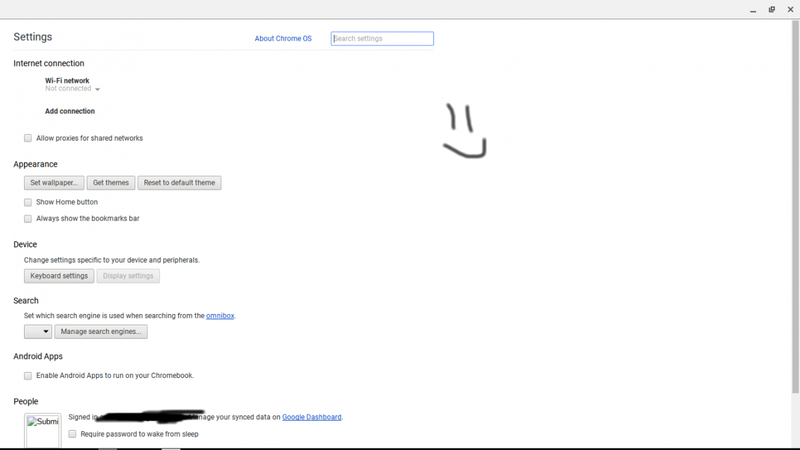 Will Google follow through and bring Android apps to Chrome OS? Do you think this can save Chrome OS? Let us know in the comments below.